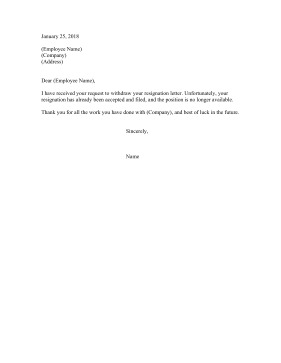 An employer who has already replaced an employee who resigned can use this letter to notify them that their resignation retraction has been refused. I have received your request to withdraw your resignation letter. Unfortunately, your resignation has already been accepted and filed, and the position is no longer available. Thank you for all the work you have done with (Company), and best of luck in the future.